It is highly gratifying that since the appearance of my definitive work, "So You Want To Be A General" in BAR Number 49 (April 1975), no less than 64 officers have exploited my advice. All have been promoted and their names now grace those unthumbed pages at the front of The Army List. The letters of gratitude received from these gentlemen have been overwhelming, and so it is with a deep sense of public duty that I feel I must reveal the dynamic system that has enabled me to race through the rank of Second Lieutenant in a mere two years, and which has every chance of providing me with accelerated promotion to Captain in but four years more. 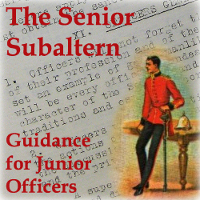 The successful subaltern, on promotion, is perfectly placed to mount an effective assault on the somewhat tedious middle ranks of Captain, Major, Lieutenant Colonel and Colonel. He will, by the time he is 27, have established such a reputation that he should be able to coast until he joins the Generals, the third most important power group in the Army (the Wives' Club and the Sergeants' Mess being seeded 1 and 2). Captains and above who may have been drawn to this paper are advised not to continue because, as all is revealed, they may well discover that their performance as subaltern left something to be desired. Serious damage to their morale could result. Such officers are encouraged to read the other articles appearing in this copy of BAR, all of which are educational and of therapeutic value. Captains and above ignoring this warning proceed at their own risk. Rule Number 1: Know your enemy and avoid him. Rule Number 2: Know your enemy and supervise his bath. Rule Number 3: Know your enemy and charm her. Rule Number 4: Know your enemies and join them. Rule Number 5: Know your enemy and don't be his assistant. Rule Number 6: Drink water in the Sergeants’ Mess.